Boruto: Naruto Next Generations has been flirting with the connections between the past (Naruto, Naruto: Shippuden) and present (Boruto) all along, with the series giving longtime fans some great new context for heroes and villains they thought they knew. Case in point is the latest episode of Boruto, "The Other Side of the Moon", which finally gave Naruto fans the long-awaited first encounter between Boruto and Orochimaru! 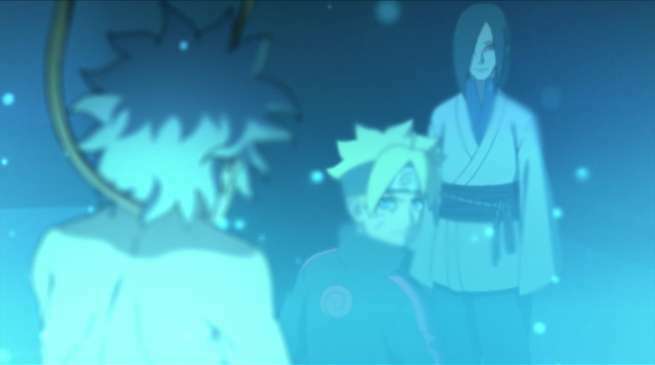 Episode 73 picked up with Boruto and Sarada sneaking off to Orochimaru's lab, while Naruto and the other Shinobi leaders of Hidden Leaf set out to both retrieve their wayward genin, and capture Mitsuki, so they can officially identify where his loyalties lie. Lucky for Bourto and Sarada, they get to their destination first, which leads Boruto to make a shocking discovery, and have a somewhat unnerving encounter with the mad scientist Orochimaru. "There's no need to worry. If anyone gets wind of what he is, the curse mark that I implanted inside of him will automatically activate, and he will self-destruct. So there's no need to worry that the secrets of my research will be revealed." Catch new episodes of Boruto: Naruto Next Generations streaming weekly (in a new timeslot) on Hulu, Crunchyroll and Funimation.